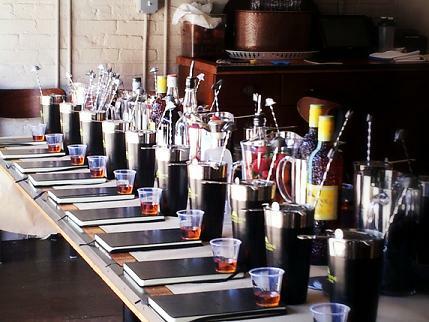 My primary concern at a cocktail lab is to not out myself as a pleb. I'd like to think I know a thing or two about cocktails, but in the presence of people who know lots of things about cocktails, who create drinks for a living, who can produce a drink with egg whites where the foam is as thick as the head of a Guinness, well, I basically know nothing. At least twenty "students" attended the Emperor's Coffee Lab at Mindy's Hot Chocolate this past Sunday. We squeezed into a few tables set with cocktail shakers, strainers, and bar spoons to learn about Mandarine Napoléon (a blend of cognac and mandarins) and how to prepare coffee drinks with it. Our host, Marc de Kuyper presented some information about the liqueur, which had been made for Napoléon Bonaparte. Then Alex McDaniel and Alex Gara (Head Barista and Bar Manager, respectively) launched into the drink-making segment. We'd be using cold-brewed coffee in the cocktails. And the Mandarine Napoleon, a striking, vibrant orange, with spices like cardamom and nutmeg was a natural partner to the coffee. The lab began with Gara demonstrating how to prepare the Kitchen Sink cocktail, which sent a few of us nerdy types scribbling the recipe in notebooks, before we were released to make it ourselves. A small chaos broke out. Hands snatched at blackberries, raspberries, or strawberries from the glass pitchers, the stainless steel muddler was passed back and forth, voices called out again and again how much Pimm's, how much gin? Even though he insisted we didn't need to worry about discrete measurements, rather get the proportions roughly correct (3-to-1 Pimm's to gin). That's when you realize everyone knows about as much as you do. You're all in this together. You're all in this to create and to drink. The second cocktail involved egg whites, so instead of a free-for-all, groups of us went to the teacher's station, and Gara walked us through the recipe, which included late harvest Malbec, and tobacco-steeped vermouth, plus the Mandarine Napoleon and egg whites. I carefully separated the yolk from the egg white and felt a swell of pride when he asked if I was baker. I have mad egg-separating skills. The last cocktail Gara made himself while we sipped the C.C. DeMille. I felt posh holding my coupe, like I was in a Cary Grant movie. He looked like a scientist in a lab, quickly measuring, shaking, pouring amidst all the buckets and bottles, cups and utensils. That last drink was a superstar combination of chocolate, coffee, and Mandarine Napoléon plus a creamy foam. Class over, it was officially time to relax. You were having such a good time hanging out in front of the open window, sipping on your last cocktail and snacking on leftover fruit that you didn't realize you've had four total drinks in the last hour and a half (including the first Mandarine Napoléon and coffee drink you got when you arrived) until the room started to tilt. Bye everyone, that's your cue to go.